Every day we make mistakes that leave our homes vulnerable to a break-in. A burglar will always choose the easiest target and that’s good news for you – it means you have a lot of influence on whether you become a victim or not. Hiding keys by doorways – leaving keys near door ways is very risky as you risk someone duplicating your key and breaking in whenever they want. Leaving out mail – an overflowing mailbox is a good sign that no one is home as well as it allows criminals to steal your mail and gain personal information. Open windows – windows are often the easiest entry point for burglars to access your home as doors can be sturdy and deadlocked. Leaving valuables in sight – valuables should be left out sight so that burglars and stored away as expensive items signal that you have money and is a clear indicator to a burglar that your home is worth targeting. 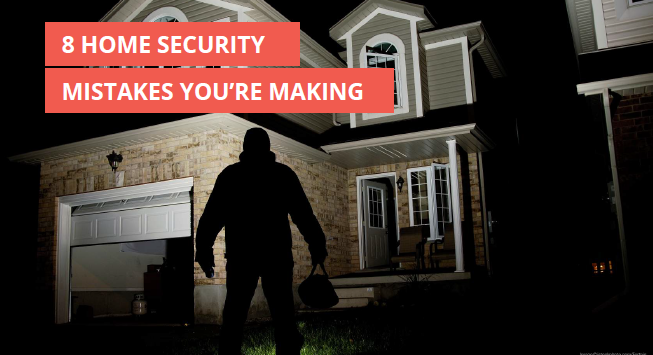 No visible security – securing your home with burglar bars and visible security measures is a huge deterrent to burglars. Not maintaining your yard – a messy yard is a signal to a burglar that you are an easy target as untrimmed trees and hedges make for potential hiding places. Updating social media – avoid using social media to let strangers know your whereabouts as you never know who is following you online. A lifeless home – leaving lights and the TV / Radio on a timer can signal to a burglar that someone is home. Cammy is an Australian company that captures motion detected events only, saving you from searching through meaningless footage.